Coláiste Muire Ennis TY students: Euroscola Video Clip Competition Winners! In this year’s Euroscola competition students had to create a one-minute video clip on ‘My EU Election Campaign’. One winning school was selected from each of Ireland’s three European constituencies. Students were asked to take their inspiration from the big democratic advances of 1918, when women in Ireland won the right to vote, and for the first time a woman was elected to both Dáil Éireann and the House of Commons. Standing as a candidate in the next EU Elections students were asked to describe the issues most important to them. The video clips were assessed by an independent judging panel, chaired by the Head of the European Parliament Office in Ireland. The winning students (24 plus 3 teachers) will travel to the European Parliament in Strasbourg and experience a day as an MEP (21 March 2019). They will join their peers from across Europe engaging in the EU decision-making process through debates, negotiations with their colleagues, voting and adopting resolutions on topical European issues. 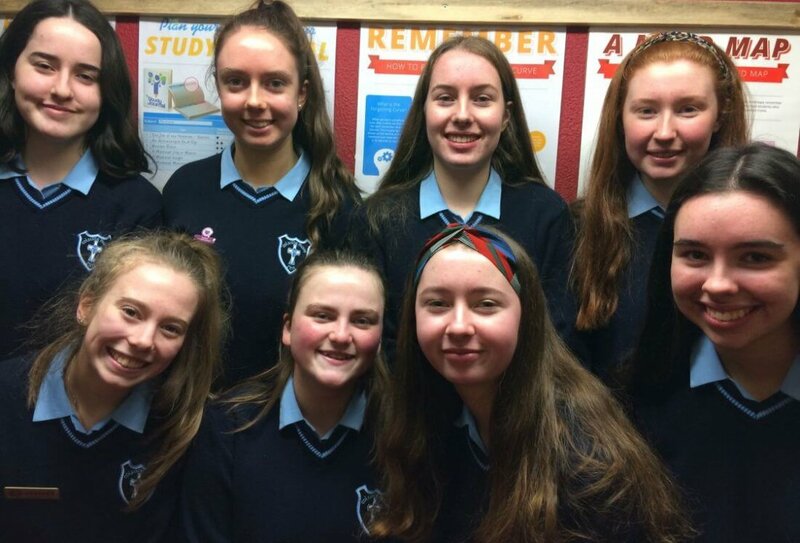 Well done to Lily Price TY4, Annie McEldowney TY4, Ciara O’Connor TY4, Orla Commons TY1, Cliodhna Spriggs TY4, Aoibhin O’Donoghue TY4, Aoife McDonnell TY2 & Aoife Buckley TY2.